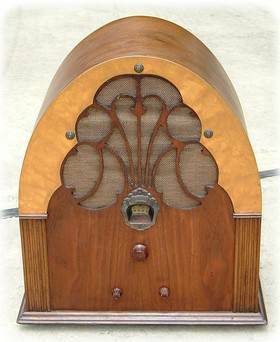 Here is a gorgeous PHILCO model 20 DELUXE tube cathedral radio. 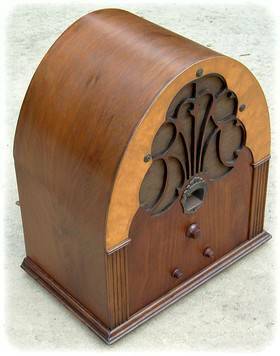 This radio is from my own personal collection. I have owned it for close to 30 years. 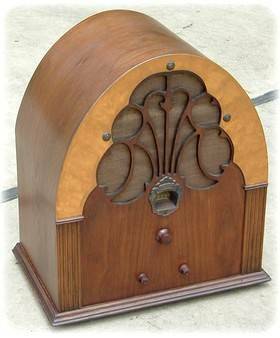 Safer double-boxing of this radio will end up making the shipping cost somewhat expensive (due to the weight of the radio and the resulting large size of the outer shipping box.) If you are a penny-pincher regarding shipping costs, then this item is not up your alley. Hoping you can answer a question for me. I have an Amplitrex and a TV-7D/U tube tester. The Amplitrex tests a 12ax7 as new at 1600GM. According to your TV7 GM calculator, I believe that should translate to 64 on the TV meter. However, when I test the same 12ax7 on my TV-7 the meter only hits 42. Does it sound like my TV7 needs some calibrating or am I missing something? Hope you can help and thanks for the great calculator. I have your article on “Repairing HP Officejet R-series”. I used it several years ago; cleaning the mirror fixed the problem. I’ve lost flexible use of my hands so I wanted to get someone to do the service (suspect it needs cleaning and new bulb). Local repair services refuse to work on ink jets. Do you have a recommendation for help in the south NJ area? Here is a letter from the Technical Service department of CBS Hytron tube company, dated June 1954, that discusses a common problem with tube testers. In this letter [ PDF ], which I scanned and restored via Photoshop for better readability, a person from the Max Fischman Co of Pittsburgh wrote to CBS Hytron Co. asking them why so many CBS Hytron 12BH7 tubes were testing weak on their Hickok 533A tube tester. CBS Hytron investigated the matter by testing 50 CBS Hytron 12BH7 that were known to be top quality and passed factory testing. They also tested 12BH7 from other manufacturers. Their analysis revealed that the test configuration — the operating point — for 12BH7 as provided by Hickok was incorrect to target the listed micromhos value of 2380 µmhos. Again, as I have tried to instruct in previous articles, there is no such thing as a “correct” (or single) mutual conductance score. Mutual conductance is a result of the operating point of the tube (plate voltage, signal voltage, grid bias, etc.). 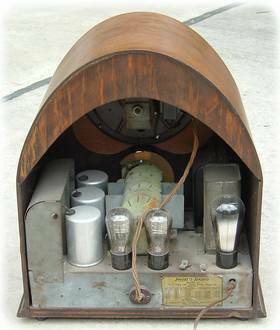 Factory setup data OFTEN provides a substandard operating point for the tube in question. This is sometimes because of mistake or carelessness in creating the setup data, and sometimes due to design limitations of the test circuit (one fixed signal voltage that is substandard for a particular tube, or a fixed plate/screen voltage that is substandard for that tube). Learning to KNOW YOUR TUBE TESTER is of utmost importance, not blindly relying on the results that you see on the meter. A seasoned tech who worked with 12BH7 tubes on a regular basis would have discovered this issue and learned to work around this problem — either by creating a new Bias setting that more appropriately would target 2380 for a typical new 12BH7, or he would have noted what Gm score was more accurate at the bias point given in the setup chart. NOTES: (1) the letter refers to mutual conductance readings as “Sm”, which I am not aware of that abbreviation. I believe that “Gm” is the standard abbreviation. (2) the secretary who typed the letter misspelled Hickok as “Hickock”. Enter your meter reading (0 – 120) into the “Meter” box. Choose your Range Switch position in the drop-down box. Press the “Calculate Gm” button and read your micromhos score. Press “Reset” button to clear your entries or to start another calculation. Invalid entry ( meter > 120 ) will automatically reset the calculator. Range A on TV-7 is only used for emission testing of diodes and rectifiers — no mutual conductance reading exists. Therefore, I have omitted Range A from the calculator. The Range A meter reading is an arbitrary emission score that is evaluated in relation to the “Minimum Value” notation in the setup book. Range F signal voltage is 0.5v ac (500 mV) with bias 0 to -4 vdc. Range F is 0 to 30,000 micromhos, not 60,000 as reported elsewhere. Click to “Read the rest of this entry” below for details.